This is a multi-part tutorial on how to use filters in AppGini. Filters are a powerful means of searching tables. This tutorial explains how they work, and shows how they can be controlled programatically. In part 1, we'll understand how to apply a default filter to a table. This tutorial is a coding tutorial. You'll learn here how to program filters into pages. We'll write some html and php code to achieve this. If you're looking for a tutorial on how to use the filters page to perform a search, please refer to the section working with filters of the online help. 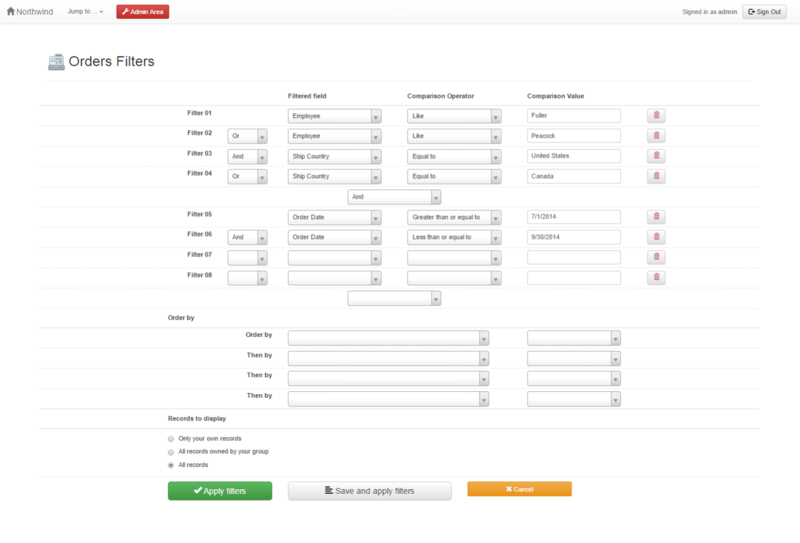 The filters form in AppGini passes several variables to the application that define filters. If we understand these variables, we'll be able to create default filters, enforce a filter on pages, build customized search forms, ... etc. Each filter has an index that identifies it. The first filter has an index of 1, the second one has an index of 2, and so on. We could define up to 80 filters (but that could possibly slow down our queries). Each filter is composed of 4 variables, as outlined in the table below. or Specifies how this filter is combined with the previous one. For the first filter (i=1), there is no need to specify a value for this variable. FilterField[i] 1, 2, 3, .. etc. Specifies which field in the table is to be filtered. The first field of the table (as defined in your AppGini project) is 1, the second is 2, ... etc. Where i is the index of the concerned filter, a value from 1 to 80. In many AppGini applications, we'd like users to view only a subset of data rather than viewing all the records of a table. For example, in the orders table, we might want users to view the orders as of 1/1/2009 only. To do so, we'd write the PHP code for filtering the orders table by date as follows. Let's say we want to filter orders to display only the orders of January 2009. In this case, we'll add another filter to our code to limit orders to the period from 1/1/2009 to 1/31/2009 . We've now finished part 1 of this tutorial. We've learnt how to enforce a filter on users when they view a certain table. In the next part of this series, we'll learn how to further customize the enforced filters. In this tutorial, I'm assuming the date format specified in your AppGini project is "Month, day, year" with a Slash separator. If you're using a different format, you should change the code above to reflect that format.